If you know anyone with endometriosis, then you'll know the debilitating pain it can cause, especially during the menstrual cycle. TV star Tia Mowry is one of the 176 million women in the U.S. who suffer from the disease, but she wasn't about to sit idly by and let it ruin her life. After years of enduring migraines, eczema, and skin concerns, Mowry took her doctors advice and changed her diet to cure her symptoms. Desperate to see change, she ditched dairy, refined sugars, and processed foods to astounding results. Not only did her migraines clear and her skin glow, but she also became pregnant with her adorable son, Cree—and she recently gave birth to a baby daughter, Cairo. 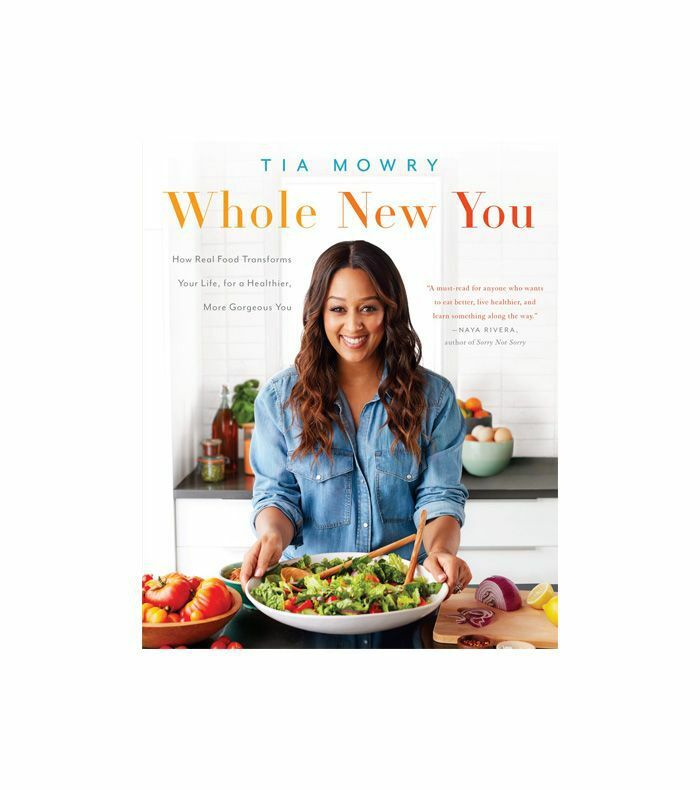 Mowry details her phenomenal health transformation with enriching recipes to help others switch to a dairy-free, sugar-free diet in her new book, Whole New You. To find out more, we quizzed her about the healing foods she always keeps on hand, her favorite sugar alternatives, and how she educates her son to make healthier choices. Be sure to scroll to the end for four exclusive endometriosis diet recipes from the book. Your book talks about when you were first diagnosed with endometriosis and how a doctor connected your diet to your health. What are some of the diet changes you made that improved it? The biggest improvement health-wise for me was staying away from highly inflammatory foods like dairy and processed foods. I was suffering from a serious inflammatory condition and eating foods like dairy, processed sugar, and white bleached flour would worsen the situation. After eliminating them, I saw a huge improvement with my endometriosis. We interviewed a doctor recently who doesn't think any of us should be eating cheese, and you also mentioned going off dairy in your book. Can you share your journey? How do you feel? What do you eat to replace it? I love that doctors are now voicing their knowledge on this. The first time I heard that I needed to stay away from dairy was from my own doctor. I found that when I eliminated dairy from my diet, not only did my endometriosis improve but so did my other highly inflammatory conditions that I was suffering from (like migraines and eczema). I am a true believer in this because once I stayed away from dairy in general even my skin improved. People are always asking me about my skin and how it is so clear, and it really is about what you eat. I truly believe that when you eliminate dairy, you will see health benefits. One of my favorite things to substitute dairy with is coconut milk. It has that nice creamy texture that milk has, so when you are substituting it, you don't miss it. Another is almond milk and rice milk. These milks have a thinner consistency and aren't as creamy and sweet as coconut milk. There are so many substitutions. What are some of the healing foods that have worked for you? Healing foods are whole foods that consist of fruits, veggies, whole grains, seeds, and nuts. One of my favorite healing foods is unsweetened coconut yogurt. It's healing because the yogurt is loaded with probiotics and good bacteria that helps fight off free radicals. I also like leafy greens like kale, which is loaded with iron, and garlic, which works like an antibiotic and is good for heart health. Also fruits like strawberries, raspberries, and blueberries, which are loaded with antioxidants. What are your top five must-have foods you always keep in the pantry? I would say healthy snacks like nuts (almonds, walnuts, and cashews), olive oil, apple cider vinegar, grains like brown rice, and anything above 85% raw chocolate. Some people think chocolate is bad for you, but it's the preservatives and sugar they put in it that are bad. Raw chocolate is actually really good for you. What are your favorite sugar alternatives? My favorite sugar alternative is stevia. It has zero calories, and it's a plant. My other favorite is maple syrup, I put it in my granola that I make from scratch, and I also put it in my sauces. Another great one is coconut sugar. Can you share some of the foods or food groups we should steer clear of? I would say anything that has processed sugar. Even if you don't have some underlying condition, I think as a whole processed sugar is good to stay away from. It's good to steer clear of processed sugar, additives, and the antibiotics that they put in chicken and beef as well. How can working moms educate their children on these healthier options? How do you teach your son? I think leading by example is the biggest advice I can give. When you practice what you preach, kids really pay attention to that. Introduce healthier alternatives and whole foods to kids at a young age. They only know what's in front of them. What is the secret to squeezing more greens and veggies into our children's diet? Throw them in smoothies! Last night my son asked for a smoothie for when he went to the pool today. You can take your berries and other fruits and then throw some spinach and an avocado in there, and they will never know the difference. The other secret is juicing. Kids love being a part of projects, and my son loves juicing. You can juice apples and carrots and then throw in some celery with orange juice. Kids love helping with little projects, so just involving them in the kitchen with you becomes an enjoyable experience. Keen to try a sugar-free, dairy-free diet too? Below, Mowry shares four exclusive recipes from her book to get you started. "Did I mention I love pancakes? Well, I still eat them. However, these ones are filling and energizing without leaving me bloated, and they're a fun way to start the morning. They're also a favorite of Cree's—your kids will love 'em, too!" In a medium bowl, add the flour, baking powder, coconut sugar, salt, and nutmeg. Whisk to combine. In a separate bowl, add the almond milk, egg, and vanilla. Beat with a fork or whisk until blended. Pour the milk mixture over the flour mixture. Add the mashed bananas. Using a fork, stir until just combined. Let the batter sit for 5 minutes so the baking powder can activate. Meanwhile, add the blueberries to an 8-inch skillet over medium-high heat. Cook, shaking the pan a few times, until the blueberries deepen in color and look like they're about to burst (it's okay if some do), 3 to 4 minutes. Remove from heat, and set aside. Add a few drops of oil to a 10-inch skillet over medium heat. Once the oil is shimmering, drop 1/4 cup of batter at a time into the pan (you’ll need to cook the pancakes in 3 to 4 batches). Cook until the edges of the pancakes look set and little air bubbles form on top, about 2 minutes. Then, using a spatula, flip the pancakes and continue cooking for 1 to 2 minutes more until they are golden underneath. Repeat with the remaining batter. "We discovered a version of this dish in New York City while Cory was promoting the movie American Sniper. Quinoa has become quite a popular ingredient, but I had never seen it served with an egg. I was instantly impressed by the many differ­ent textures and flavors of the combination; the quinoa is chewy and nutty, while the shiitake mushrooms are earthy and almost meaty. The egg gives it a heartiness and substance, while the collards lift the whole dish with their crispy, green crunch. I was so taken with it, I went ahead and created a kicked-up version that includes hot sauce—yum! This is a great dish to serve at any meal. Use the cinnamon when you make it for breakfast." In a medium pot, add the quinoa, broth, garlic, cinnamon (if you’re using it), and soy sauce (or tamari). Season with salt. Cook over medium-high heat until the mixture begins to boil. Re­duce the heat to medium-low. Cook until the liquid has been absorbed, about 15 minutes. Meanwhile, in a 10-inch skillet, heat 2 tablespoons of oil over medium-high heat. Add the mushrooms. Season with salt and pepper. Cook, shaking the pan once or twice (no need to stir the mushrooms vigorously as they won’t brown well if you fuss with them too much), until the mushrooms are tender and lightly golden, about 5 minutes. Transfer them to a dish and set aside. "Sweet potatoes are awesome on their own. But if you're like me, you like to make good things even better. Ever mixed cream cheese and coconut cream into a sweet potato and baked it twice? Well, you will now. You're welcome!" Use a sharp paring knife to make a few slashes all over the sweet potatoes. Place them in an 8 x 8 x 2-inch pan. Bake until very tender when pierced with a fork, 45 to 50 minutes. Remove from the oven, and let cool slightly. Slice the potatoes in half. Use a spoon to scoop the flesh out, making sure to leave a 1/4-inch border inside the potato skins so that they hold their shape. Place the skins back into the baking pan. In a medium bowl, combine the sweet potato filling, coconut cream, cream cheese, 1 tea­spoon of the chives, salt, and nutmeg. Use a hand or stand mixer to beat the potatoes until they are well mixed and fluffy. Spoon the filling back into the skins. To make the topping, add the walnuts and oats to a mini food chopper or food processor. Pulse a few times until coarsely chopped. Stir in the maple syrup. Sprinkle the topping evenly over the filled potato skins. "These are my favorite. I mean, come on… Who doesn't love a chocolate chip cookie?" Preheat the oven to 350°F with the rack adjusted to the center position. Line 3 baking sheets with parchment paper (if you have only 2 sheets, just reuse the sheet from the first batch you bake; no need to change the paper). In a deep bowl, combine the oil, sugar, egg, and vanilla. Whisk until smooth and ingredients are incorporated. Add the flour, baking soda, and salt. Stir with a wooden spoon until ingredients are just combined and there are no visible signs of flour. Stir in the chocolate chips. Drop balls of dough (just shy of 1 measured tablespoon each) onto the prepared baking sheets, 2 inches apart (you should be able to fit 15 cookies per sheet). Bake, 1 sheet at a time (it’s important for the cookies to bake evenly), until the bottoms and edges are lightly golden and the tops look set, 8 to 9 minutes. Let the cookies cool on the baking sheets for 5 minutes. Use a spatula to transfer them onto a wire rack to cool completely. Store cookies in a covered container for up to 3 days, but they never last that long in my house. This post was originally published on April 21. 2017, and has since been updated.